Free Kindle promotion from Feb 23 - Feb 27. 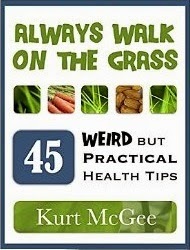 Have you ever considered the fact that walking on grass instead of on a sidewalk might be better for your knees and lower back, and consequently for your overall health? What about closing your eyes when you shower? Skinning your fruits and vegetables? Cleansing your colon occasionally? We perform habits daily based on accepted social practices. The problem is that many of these social practices are clearly based on convenience and tradition, not on logic. What I suggest in this book is that we should rethink the very way we think about our daily habits. Simple activities likes stretching out our book a few inches further when reading, purchasing ergonomic pens, and showering on our knees may seem weird to others, but to me--and hopefully to you--these "weird" practices represent a new way of thinking beyond social norms and may help us reclaim the health that is hidden behind a veil of perfunctory living. Stop modeling your life after your unhealthy peers. Learn to think differently about your health and don't look back.